Eastman rallied yesterday on the news that Blackstone were putting their recently acquired acetate tow business together with Celanese’s business in a joint venture. While we believe that this is a very good move for Blackstone and Celanese we do not buy into the idea that this is good for all in the business; in fact we could make a strong case that it is worse for Eastman. While reducing the number of players in the market may seem like a good thing, it is not EMN or CE or Blackstone that has been responsible for the weakness in the market. The Filter Tow business is being undermined by new capacity and new players in China against a backdrop of reduced growth rates and in many markets slowing demand for filtered cigarettes. Cost cutting to remain competitive, through the combining of two businesses to be run as a single business – one set of overheads and SG&A goes away. A possible exit strategy of both companies if the business is large enough and has enough cash flow to support itself. Eastman remains independent and now has a stronger, lower cost, competitor in CE/Blackstone. 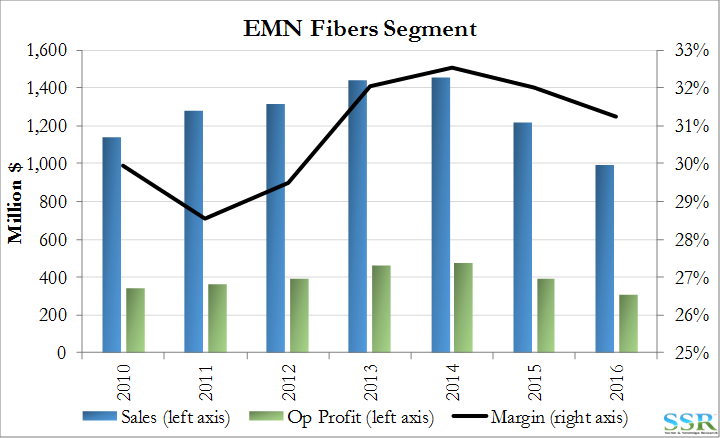 EMN is just as likely to see increased competition and weaker pricing from this move as it is to see any sort of market structure improvement to help its margins. If there was any real expectation that this deal would improve pricing power in the industry, it is unlikely that it would pass regulatory scrutiny, especially in Europe. Given the history between Blackstone and Celanese, it is unlikely that EMN got a look at this opportunity, but the company should have been pro-active in trying to step in front of Celanese. We remain concerned that despite significant potential value in EMN – Exhibit 1 – this value will be hard to unlock with a management team and a strategy that remains largely unchanged from when the current CEO took over, despite dramatic changes in the competitive and energy landscapes. EMN remains on our attractive list only because we believe that someone else will try to shake things up – like our prior views on DD in 2015 and Akzo in 2016. Unlike PX and HUN, EMN shows no signs that there is an internal desire to think outside the box. 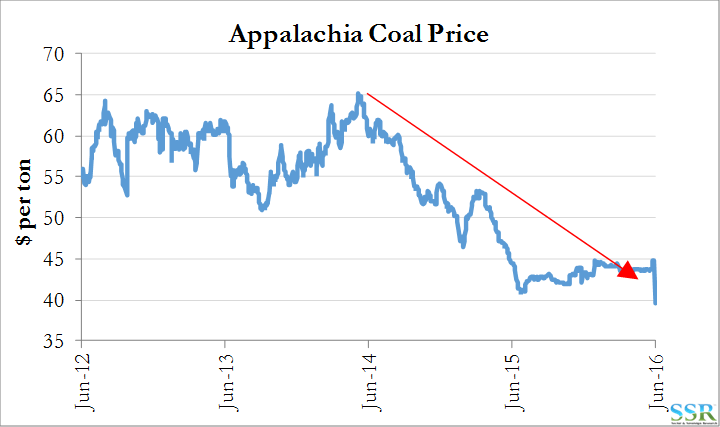 Note that in Exhibit 2, EMNs performance in this business would have been significantly worse had it not been for a collapse in US coal prices from 2014 to 2016 – Exhibit 3 – coal is the primary feedstock for this business for EMN in the US.